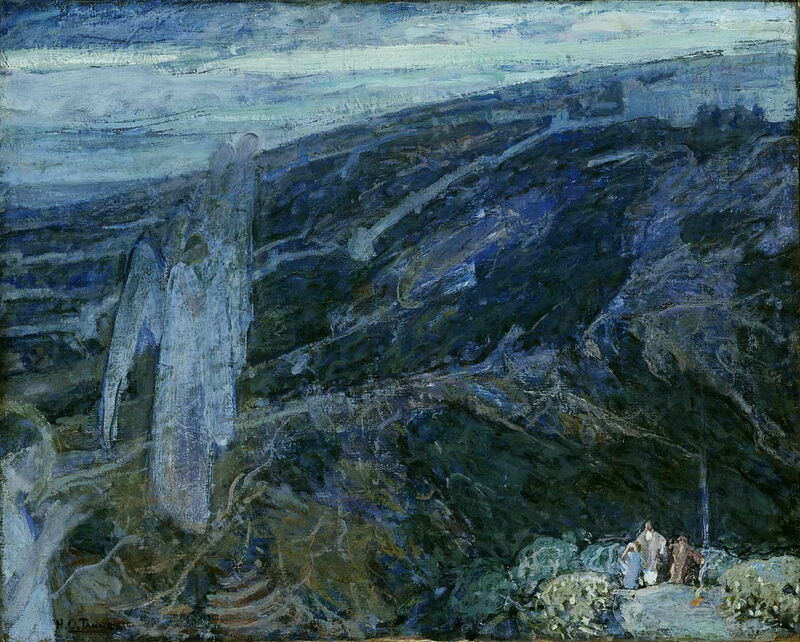 Henry Ossawa Tanner (1859–1937), The Arch (1919), oil on canvas, 99.7 × 97 cm, The Brooklyn Museum, New York, NY. Courtesy of The Brooklyn Museum, via Wikimedia Commons. In the previous article, I showed a selection of paintings by Henry Ossawa Tanner (1859–1937) and traced his career to 1902. At that stage, he was established in Paris as a successful Post-Impressionist, with a strong showing mainly in genre and religious works, and an international reputation. Henry Ossawa Tanner (1859–1937), The Good Shepherd (1902-3), oil on canvas, 77 x 92 cm, Zimmerli Art Museum at Rutgers University, New Brunswick, NJ. Wikimedia Commons. 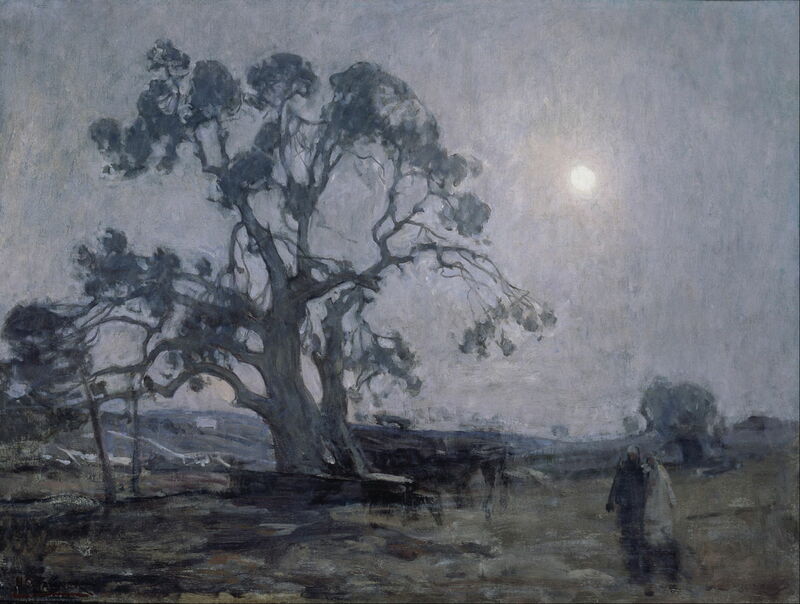 The Good Shepherd (1902-3) is a good example of the very loosely painted, almost monochromatic nocturne in which he created great ‘atmosphere’, although sacrificing narrative. Henry Ossawa Tanner (1859–1937), Abraham’s Oak (1905), oil on canvas, 54.3 x 72.7 cm, Smithsonian American Art Museum, Washington, DC. Wikimedia Commons. Abraham’s Oak (1905) shows an ancient oak tree, which only died in 1996. Tradition (if not legend) holds this to mark the place where three angels appeared to Abraham, or Abraham pitched his tent. The location is just southwest of Mamre, near Hebron. The story runs that Abraham washed the feet of three strangers who appeared there, and showed them hospitality. They revealed themselves to be angels, and informed Abraham that his wife would become pregnant and bear him a son. This is used as an example of the importance of showing hospitality to others. Henry Ossawa Tanner (1859–1937), The Flight into Egypt (c 1907), oil on canvas, dimensions not known, Cincinnati Art Museum, Cincinnati, OH. Wikimedia Commons. 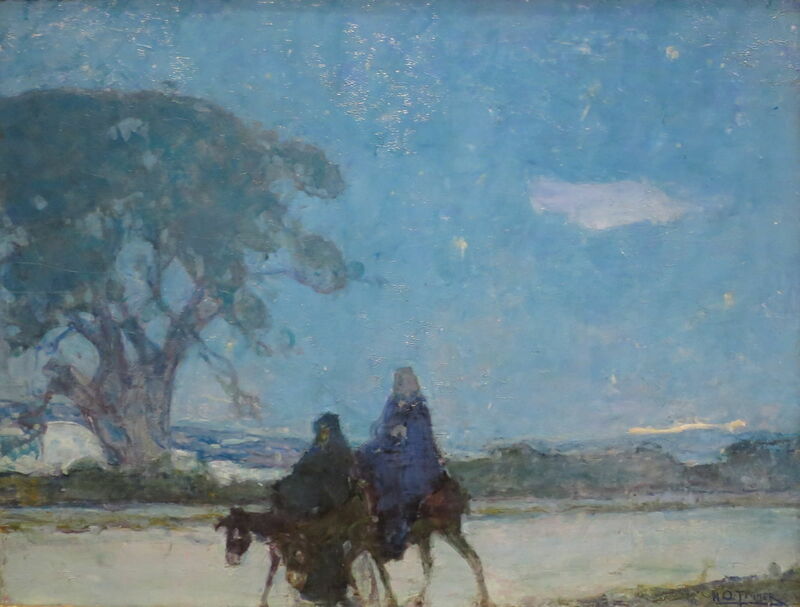 The Flight into Egypt (c 1907) is one of at least two paintings in which Tanner showed Christ’s family fleeing to Egypt to avoid Herod’s imminent massacre of infants, as described in the Gospel of Matthew (2:13-23). This has long been a popular story for paintings, which often incorporate a highly inventive landscape. With his recent experience of travel in both Palestine and Egypt, Tanner has clearly tried to be more geographically appropriate. In early 1908, Tanner’s travels took him to Algiers. At the end of that year, he had his first major solo exhibition at the American Art Galleries, New York. Then in the following year, he was elected an associate member of the National Academy of Design, along with the American Impressionist Mary Cassatt, and George Bellows. Henry Ossawa Tanner (1859–1937), Angels Appearing before the Shepherds (c 1910), oil on canvas, 65.3 × 81.1 cm, Smithsonian American Art Museum, Washington, DC. Wikimedia Commons. His Angels Appearing before the Shepherds (c 1910) took his loose brushstrokes, rubbings, and scumbled passages closer to Symbolism, in telling this simple episode from the story of the nativity. He limits his colours tightly, with a single small patch of orange at the lower right, indicating a small open fire, amid an abundance of blues and a few greens. The angels on the left are so ethereal that they could at any moment dissipate like a puff of smoke, and the three shepherds are almost insignificant by comparison. 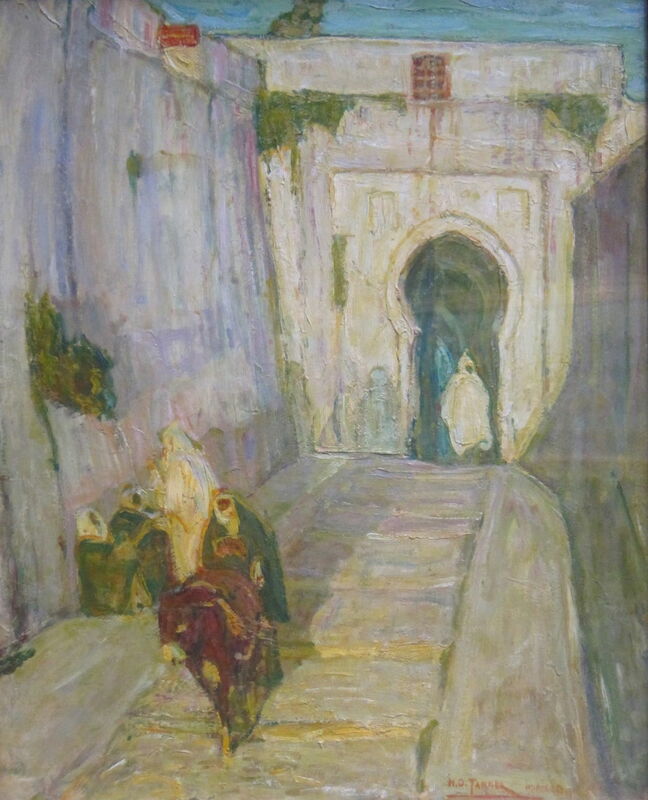 Henry Ossawa Tanner (1859–1937), Gateway, Tangier (c 1910), oil on plywood, 57.2 × 48.3 cm, Smithsonian American Art Museum, Washington, DC. Wikimedia Commons. The keyhole-like Gateway, Tangier (c 1910) showed his fascination with the shape of such entrances in north African architecture, which in turn may allude to Christ’s teachings. 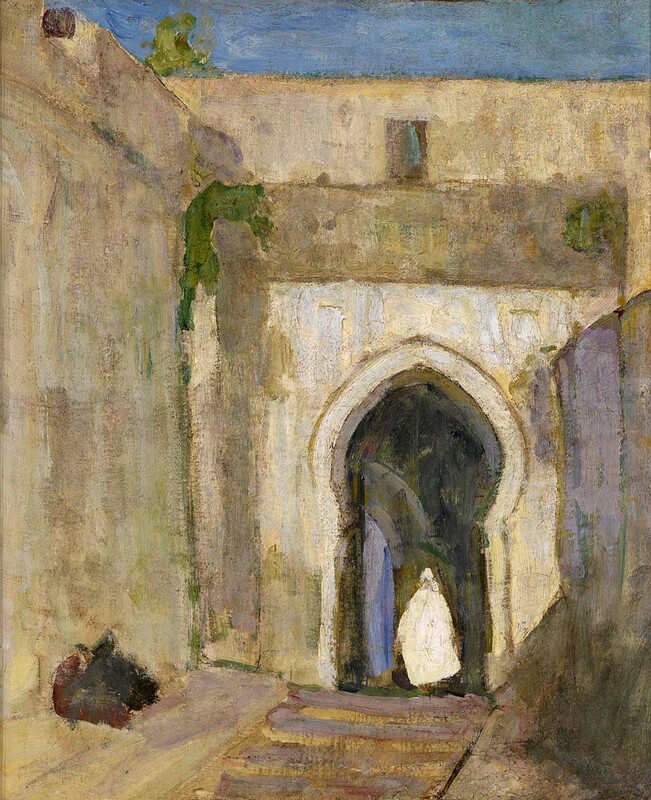 Henry Ossawa Tanner (1859–1937), Entrance to the Casbah (1912), oil on wood pulp paper mounted on canvas, 81.3 x 66 cm, Pennsylvania Academy of the Fine Arts, Philadelphia, PA. By Wmpearl, via Wikimedia Commons. An apparently identical location appeared a couple of years later, in his Entrance to the Casbah (1912). In spite of its similarity with the earlier Gateway, Tangier, it is presumed that he painted this during his return visit to Tangier and other parts of Morocco that year. Early in 1913, his works were shown in another major solo exhibition at the Thurber Art Galleries in Chicago, followed by a solo in Knoedler’s Gallery, New York. 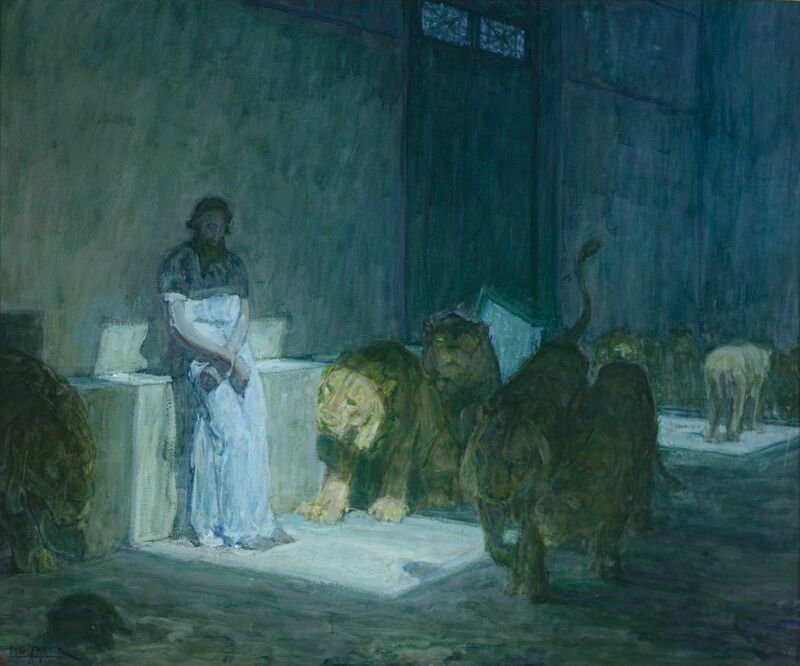 Henry Ossawa Tanner (1859–1937), Daniel in the Lions’ Den (1907-18), oil on paper mounted on canvas, 104.5 x 126.8 cm, Los Angeles County Museum of Art, Los Angeles, CA. Courtesy of Los Angeles County Museum of Art, via Wikimedia Commons. I have been unable to discover when his first painting of Daniel in the Lions’ Den became lost, but between about 1907 and the end of the First World War in 1918, he painted another version which appears to be rather looser in its brushstrokes, and is cropped slightly differently. Tanner had a fondness for painting lions since his student days in Philadelphia, and had at first considered specialising in the painting of animals. Some have suggested that this might be through a tenuous connection with Androcles and the Lion, Androcles being a slave who gained freedom and success. This version is another example of his very tightly constrained colour, and his skilled use of light, which were probably key in the original’s very successful reception. At the outbreak of war in 1914, Tanner and his family left France to take shelter in London, but he returned to carry out relief work in France during the autumn of that year. He openly admitted that he found the war very distressing, as he wanted to do something useful to help the war effort. From 1917-19, he did so by serving as an officer in the American Red Cross, in France. 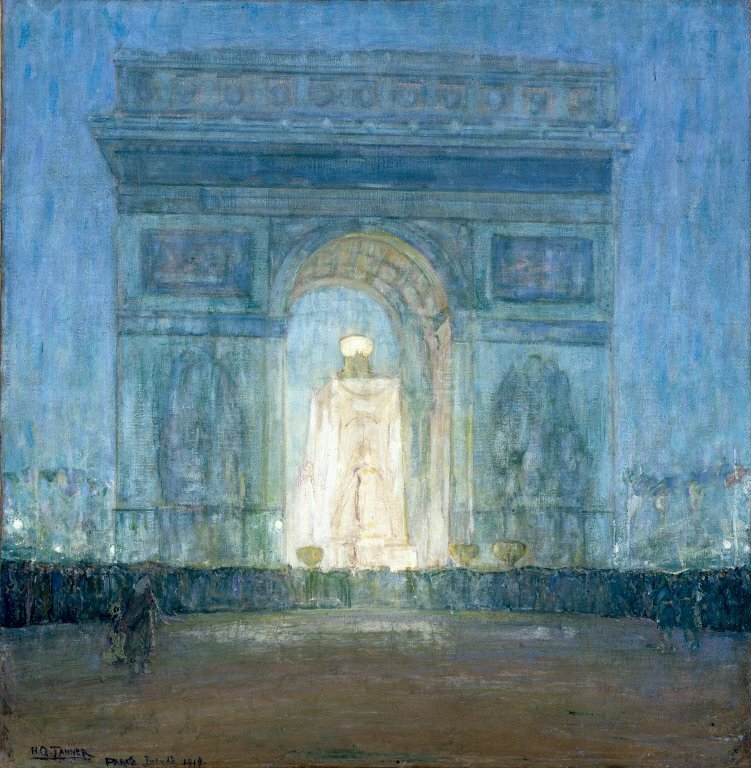 His The Arch (1919) is not the product of his imagination, but a record of events in the evening of 13 July 1919, when a cenotaph in memory of French soldiers which had been built under the Arc de Triomphe in Paris, was dramatically lit for a large public gathering. His slight readjustment to that reality may have been the symbolic addition of a widow and orphan in the foreground at the left, and a couple of uniformed veterans to the right. Henry Ossawa Tanner (1859–1937), Flight into Egypt (1923), oil on canvas, 73.7 × 66 cm, Metropolitan Museum of Art, New York, NY. Wikimedia Commons. 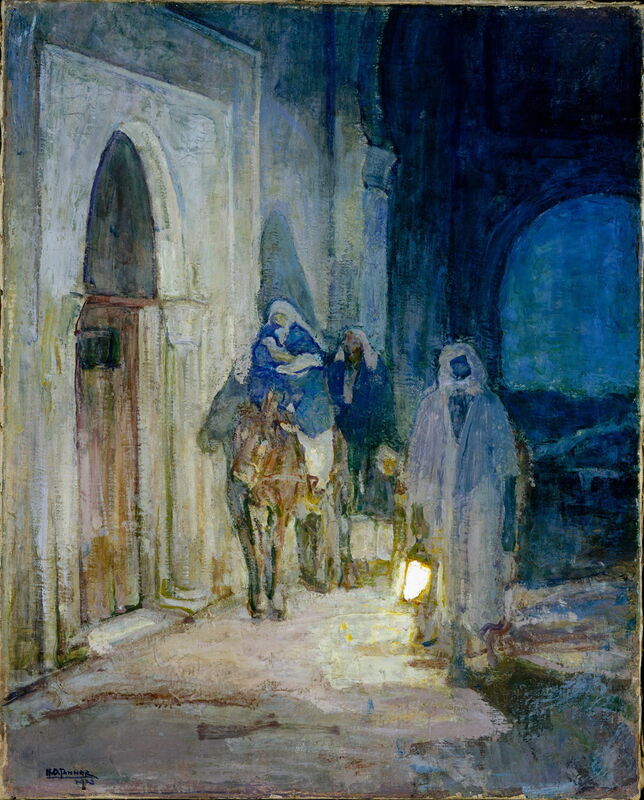 A second version of the Flight into Egypt (1923) is also set at night, but was carefully composed to show the Holy Family as a group. Again this uses light very skilfully, with the cast shadow creating the effect of a halo around Mary’s head, as she cradles the infant Jesus on her donkey. That year Tanner received the accolade from the French government of being elected to the Legion of Honour, but two years later his world collapsed when his wife Jessie died. He found it very difficult to paint after that, but still recognition and honours continued: in 1927, he was elected a full academician at the National Academy of Design. 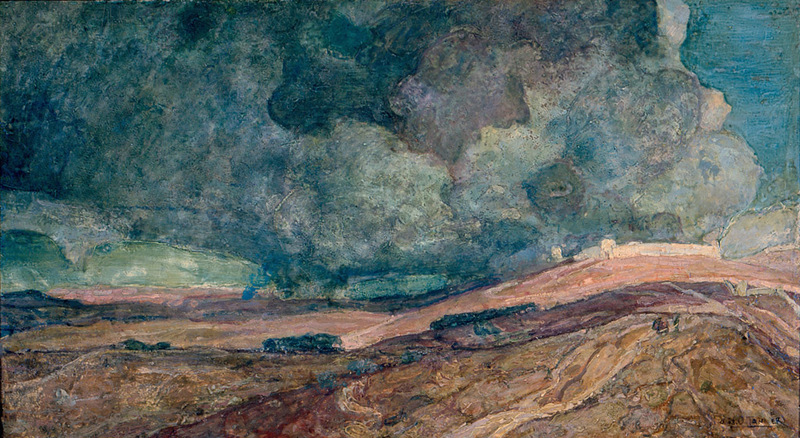 Henry Ossawa Tanner (1859–1937), The Destruction of Sodom and Gomorrah (1929-30), tempera and varnish on cardboard, 52 x 91.4 cm, High Museum of Art, Atlanta, GA. Wikimedia Commons. Among the paintings of his final years were several nocturnes on religious themes, and the more apocalyptic The Destruction of Sodom and Gomorrah (1929-30). Unusually he painted this in tempera and varnish on cardboard. In 1930, he exhibited in the Venice Biennale, and died just two years before the next World War, in France where he had painted for so long. Henry Tanner’s paintings represent many achievements, not least of which was his singular success against all the odds which were then stacked against an African-American. But that was not, by any means, his sole reason for greatness. It is baffling that any painter who was so successful in his day, in Paris, the centre of painting and several other arts at the time, should now be so little celebrated outside the country of his birth. Perhaps one important factor was that Tanner’s paintings did not catch the attention of Roger Fry when he discovered what he termed the Post-Impressionists. Neither was he a modernist, although his style continued to develop far beyond that of the late 1800s. He did remain a representational artist, though, and never appears to have leaned towards the abstract. It just goes to show – once again – how fickle and unjust art history can be, particularly during the twentieth century. Marley AO ed. 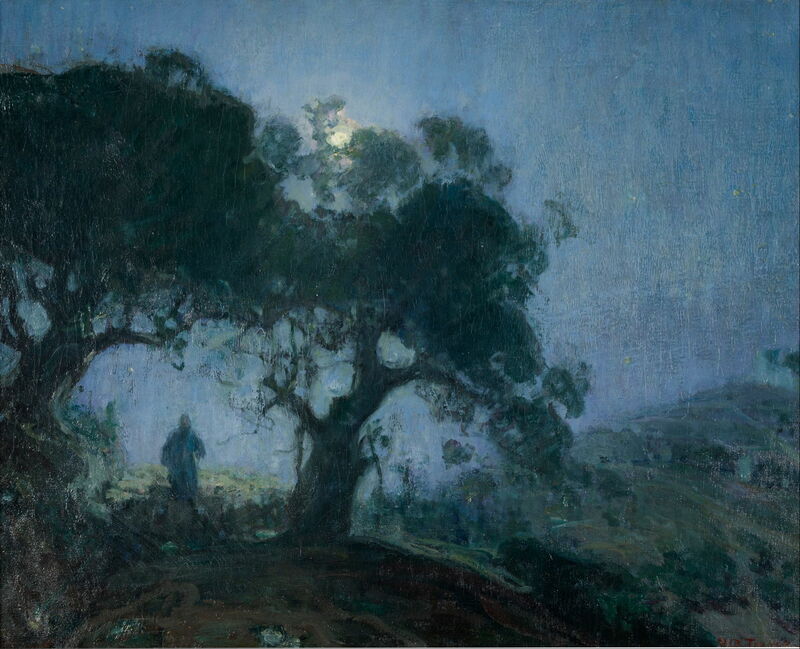 (2012) Henry Ossawa Tanner, Modern Spirit, Pennsylvania Academy of the Fine Arts & University of California Press. ISBN 978 0 520 27075 6. Posted in General, Painting and tagged African-American, Fry, painting, Post-impressionism, Tanner. Bookmark the permalink.